American fund-raising poster for victims of the war in the 'Near East', undated. The plight of the Armenian population was taken up by a number of charitable and fund-raising organisations in the USA during the First World War. 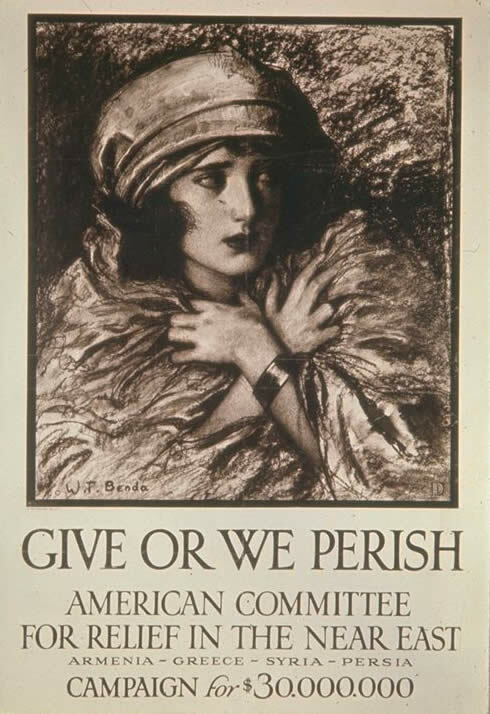 This poster was issued by the American Committee for Relief in the Near East, which was attempting to raise $30 million for victims of the war in Armenia, Greece, Syria and Persia. It was designed by the Polish-born, New York-based mural painter and illustrator Wladyslaw Benda, who became famous after the war as a maker of masks.